In January 2014 IAG launched Australia’s 500thReconciliation Action Plan (RAP)* – a commitment to recognise and solve inequality between Indigenous and non-Indigenous Australians. Our task was to create a brochure that would demonstrate their intentions to stakeholders, staff and partners, whilst reinforcing their core values of respect and equality. *500th officially accredited RAP by Reconciliation Australia. Together we believed that this was a real opportunity to convey a clear and achievable plan, whilst celebrating the lives and stories of Indigenous people. 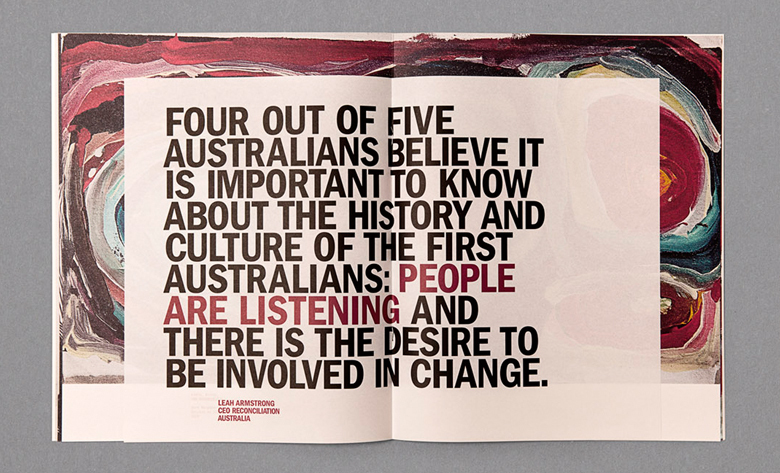 This belief is captured in the RAP brochure, which brings together portraiture, art, famous political transcripts and conversations to create a cohesive and optimistic viewpoint, helping to inform a better future for all Australians. We worked with Sydney-based photographer Gary Heery for the portraiture. Art featured in the RAP is by Martumili artists Bugai Whyoulter, Nora Nungabar and Nora Wompi.